Washington, DC – In a historic first for women’s football, President Barack Obama and First Lady Michelle Obama congratulated the D.C. Divas on winning the 2015 Women’s Football Alliance national championship in a White House ceremony yesterday. It is the first time that a women’s football championship team has been recognized at a White House event attended by the President of the United States. On August 8, 2015, the D.C. Divas defeated the Dallas Elite, 30-26, to capture the Women’s Football Alliance (WFA) national championship in Los Angeles. True to their word, the Obamas invited the entire D.C. Divas team to the White House on March 28, 2016, to pay tribute to them on their national championship victory. The President and First Lady greeted team owner Paul Hamlin and head coach Alison Fischer, who presented them with the WFA championship trophy. The Obamas then took a group photo with the team. As President Obama moved toward the door, he called back several times with a laugh, “Come on, Michelle! Time to move along!” Mrs. Obama, however, remained in the middle of the room, dispensing handshakes and hugs to every player who wanted one. The Obamas finally left the State Dining Room to the same level of applause with which they entered. 2016 marks the first time in women’s football history that a sitting president has personally recognized a championship team by attending a White House event in their honor. The D.C. Divas would like to extend their sincere thanks to the President and First Lady, Barack and Michelle Obama, for this tremendous event and for their outstanding support of women’s football. 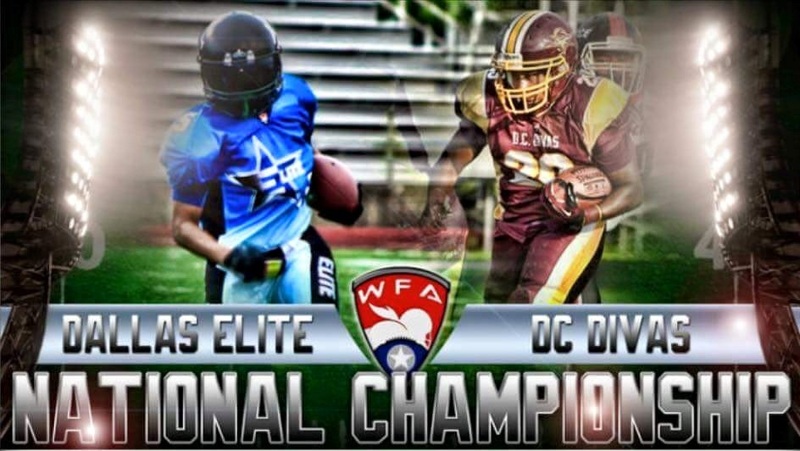 The National Conference champion D.C. Divas (11-0) will take on the American Conference champion Dallas Elite (11-0) for the 2015 Women’s Football Alliance (WFA) national championship on August 8. 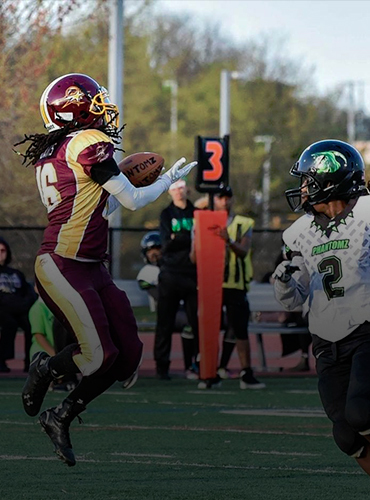 The 2015 WFA National Championship Game is the culmination of three major events held at Southwest College on August 8, featuring the best in women’s football! The day kicks off at 10:00 AM with the WFA All-American Game, featuring the very best women’s football players and coaches from all across the United States. At 4:00 PM, the 2015 Alliance Bowl kicks off, with the Atlanta Phoenix battling the Central Cal War Angels in the WFA’s premier postseason bowl game. At the conclusion of the Alliance Bowl, the D.C. Divas and Dallas Elite will finish off a women’s football triple-header as they battle for the 2015 WFA national championship. Tickets for the 2015 WFA National Championship Game can be purchased ahead of time online at www.wfastore.net. Tickets are $20 and include admission to the 2015 Alliance Bowl. Fans call also purchase an all-day ticket for $25 that includes admission to the All-American Game, the Alliance Bowl, and the National Championship Game. The 2015 WFA National Championship Game will be streamed online by PSB Media. More details to come, or visit their website for the latest information. Washington, DC – Games like this are what women’s football is all about. 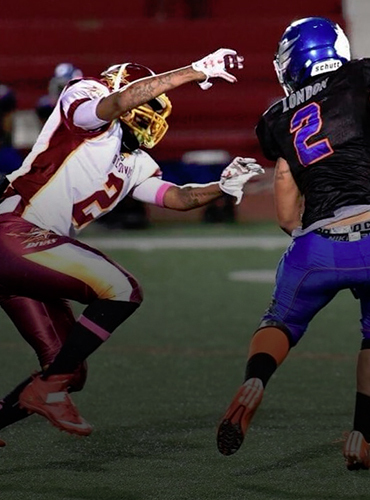 Two highly-rated teams collide in a game with major playoff implications when the D.C. Divas square off against the Cleveland Fusion Saturday night. The D.C. Divas (6-0) are ranked #1 in the Women’s Football Alliance and hold the top ranking in the sport for the first time since 2011. The Divas kept their undefeated record alive last Saturday with an impressive 54-0 road victory over the Atlanta Phoenix. The Divas overcame three uncharacteristic first half fumbles and dominated play coming out of the halftime break to earn a hard-fought victory. The Divas’ defense set the tone for the game by recovering seven Atlanta turnovers, including five in the third quarter alone. The Divas have held five of their six opponents this season to less than seven points. The Divas now return home for their final two games of the regular season, including Saturday’s clash with the Cleveland Fusion. The Fusion (5-1) are ranked #5 in the Women’s Football Alliance and have historically been rated as one of the top teams in women’s football, year in and year out. Yet despite their storied histories and close geographical proximity, the Divas and Fusion have only met one time, over ten years ago: an 18-0 Divas victory on April 16, 2005. Offensively, the 2015 Fusion have some outstanding playmakers, led by Beth Andrasik, who in her fourth season has developed into one of the top quarterbacks in women’s football. She has thrown for over 1,000 passing yards each of the past two seasons and has improved every year under center. Andrasik threw 19 touchdown passes to 13 interceptions in 2013 and improved on that ratio last season when she tossed 20 touchdowns against just seven picks. So far this year, Andrasik has 14 touchdown passes to only two interceptions. Andrasik’s emergence as a top quarterback in women’s football has coincided with the establishment of third-year Fusion wideout Maria Jackson as one of the best receivers in the women’s game. Jackson leads the WFA in touchdown receptions with 14, already setting a career high in that category and reaching the double-digit mark in touchdown scores for the third straight year. In addition to leading the league in touchdown receptions, Jackson ranks second in the league in overall catches and receiving yards behind Kansas City’s Liz Sowers. The passing connection of Andrasik and Jackson has been complemented nicely by the running of newcomer Mercedes Ephraim. Ephraim is currently leading the WFA in rushing with 921 rushing yards on the season. Overall, these three standouts have helped the Fusion compile one of the top scoring offenses in the WFA. On the other side of the ball, Cleveland has been very solid defensively, boasting the #2-ranked defense in women’s football. The Fusion’s defense is ranked behind only the defense of the D.C. Divas, making Saturday’s game a clash between two of the best defensive units in the sport. The contest Saturday will largely decide the Mid-Atlantic Division championship. If the Divas want to extend their women’s football record and capture their 12th division title in 13 years, they will need to give their best performance against an elite opponent. The Divas’ 2015 Homecoming contest is tomorrow night, Saturday, June 6, against the Cleveland Fusion. Kickoff will be at 6 PM at the Prince George’s Sports Complex in Landover. Homecoming festivities will be highlighted by a halftime ceremony honoring the D.C. Divas Hall of Fame Class of 2015: Tessa Nelson, Gayle Dilla, Vickie Lucas, and Coach Ezra Cooper. Single-game tickets are $12 with discounts for seniors, students, and service members. Buy your tickets online today! Washington, DC – The second half of the D.C. Divas’ historic 15th season is set to begin, and the challenges are getting bigger as the season moves along. The D.C. Divas will make their home debut on Saturday, May 16, at 6 PM against the Columbus Comets at the Prince George’s Sports Complex in Landover. 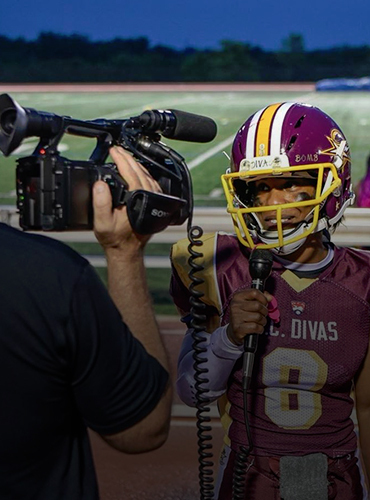 The D.C. Divas are undefeated at the midway point of the regular season and are ranked #1 in the Women’s Football Alliance (WFA) for the first time since 2011. The Divas (4-0) claimed a statement victory the last time they took the field, going on the road to defeat the Boston Renegades, 32-27. 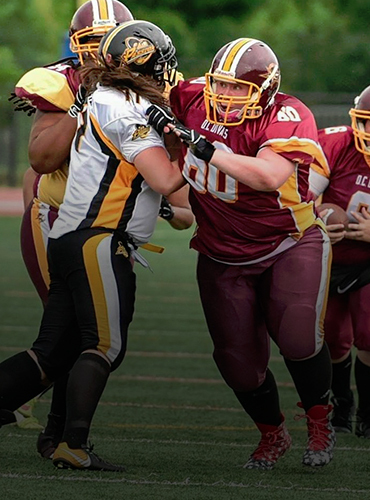 The Renegades’ roster was stocked with players and coaches that won last year’s WFA championship, but the Divas went into a hostile environment and became the first team to win a game in Boston in six years. The victory in Boston stamped the Divas as legitimate national championship contenders at the halfway mark of the 2015 season and handed them the #1 ranking in the sport. The second half of the season, however, will present even bigger obstacles for the Divas. Although the Divas have claimed hard-fought victories over the Columbus Comets and Boston Renegades so far this season, the back half of the Divas’ schedule includes rematches with both of those teams as well as contests against two more strong opponents, the Atlanta Phoenix and the Cleveland Fusion. Moreover, the Divas now have a target squarely placed on their backs; the Divas’ strong start and high ranking ensures that all of their opponents for the rest of the year will be appropriately motivated when the Divas line up against them. The D.C. Divas will square off against the fearless Columbus Comets Saturday in the Divas’ 2015 home opener. The Comets (0-4) are winless on the season so far, but this is not reflective of their talent; it is largely due to their incredibly tough strength of schedule so far this season. Despite their overall record, the Comets are currently ranked #13 in the WFA and remain a strong contender to qualify for the WFA playoffs, thanks largely to their willingness to play one of the toughest schedules in women’s football. The Divas defeated the Comets in the 2015 season opener, a 40-6 victory in Columbus on April 11. The Divas played a strong first half before struggling with penalties after intermission. The Divas were led offensively in the first Columbus contest by Kentrina Wilson, who caught seven passes for 127 yards and two touchdowns. Ashley Whisonant also added two touchdown receptions against the Comets. “I thought we moved the ball pretty well offensively in the first half. But we had a couple of drops and penalties that called some plays back, so we definitely have some things to work on,” Fischer cautioned. But overall, Coach Fischer is hoping to see similar energy from her team in their rematch against Columbus. “I was pleased with the effort. We showed a lot of hustle, so we were pleased with that,” she said. The Divas’ 2015 home opener is tomorrow night, Saturday, May 16, against the Columbus Comets. Kickoff will be at 6 PM at Prince George’s Sports Complex in Landover. The Divas are offering a special three-game season ticket package, but it is only available until kickoff tomorrow night. This is your last chance to purchase season tickets for the 2015 D.C. Divas, so make sure to reserve your season or single-game tickets today. Washington, DC – In conjunction with the team’s historic 15th season, the D.C. Divas are proud to announce the formation of the D.C. Divas Hall of Fame. This new Hall of Fame will showcase the best and brightest players, coaches, and staff members who have contributed to the D.C. Divas organization throughout the team’s history. Four new members will be inducted annually into the D.C. Divas Hall of Fame. Most importantly, like any true Hall of Fame, members of the D.C. Divas Hall of Fame will be selected through a voting process, and Divas fans and alumni will be the ones casting the votes! D.C. Divas Hall of Famers will be elected through a two-tiered voting process. Current and former players, coaches, and staff members of the D.C. Divas in good standing will conduct a separate alumni voting process and elect three individuals into the D.C. Divas Hall of Fame. However, one member of this year’s D.C. Divas Hall of Fame class will be chosen by you…the fans! Over the next month, we will announce the 20 finalists for the D.C. Divas Hall of Fame fan vote. These finalists have been selected by the D.C. Divas front office and represent some of the best eligible players, coaches, and staff members in Divas history. After the 20 finalists have been announced, fans will be given an opportunity to vote for the one finalist they think should be elected to the D.C. Divas Hall of Fame. The finalist who gathers the most votes will be introduced as the Divas’ newest Hall of Fame inductee! For more information about the eligibility requirements and voting process of the D.C. Divas Hall of Fame, please visit the Hall of Fame page here on DCDivas.com. Stay tuned over the next few weeks as we reveal the 20 fan finalists for the D.C. Divas Hall of Fame! Washington, DC – Willie Bennett, Eric Evans, and Greg Gaskins have been named as coordinators on the D.C. Divas 2015 coaching staff, the team announced today. The announcement was made by Divas head coach Alison Fischer. Bennett, Evans, and Gaskins have all served on Coach Fischer’s staff in previous years, and all three have outstanding track records in women’s football. Willie Bennett has agreed to return for his second season as the defensive coordinator of the D.C. Divas. Bennett played college football at Hampton University before embarking on his coaching career. He coached college football for 12 seasons at Alabama A&M and North Carolina A&T. While at Alabama A&M, Bennett coached Robert Mathis, the NFL’s 2013 AFC Defensive Player of the Year and the all-time career sack leader for the Indianapolis Colts. Last season, the D.C. Divas defense improved greatly under Coach Bennett’s tutelage. The Divas surrendered fewer than 24 points per game last season after giving up 32 points per game the year before Bennett’s arrival. Coach Bennett is currently an assistant athletic director for the D.C. Public Schools (DCPS) system. On the offensive side of the football, Coach Eric Evans and Coach Greg Gaskins will be co-offensive coordinators for the Divas this season. “We are very fortunate to have these two outstanding coaches leading our potent offense in 2015,” Fischer noted. Eric Evans played quarterback at Morgan State University. He was the Divas’ quarterbacks coach in 2009 and 2011 before serving as offensive coordinator in 2012 and 2013. The Divas’ offense exploded during Evans’ two-year, 20-game stint as coordinator; the offense topped 34 points in 17 of those contests and surpassed 40 points 13 times. After a one-year hiatus, Evans has agreed to return to the Divas as a co-coordinator in 2015, his fifth season with the team. Greg Gaskins has also earned a promotion to the co-coordinator role after coaching the Divas’ offensive line the past two seasons. Coach Gaskins played on the offensive line at the University of Pittsburgh, where he was a teammate of future Philadelphia Eagles running back LeSean McCoy. Under Coach Gaskins’ leadership, the Divas’ offensive line has played an integral role in the team’s offensive success the past two seasons. He currently coaches at Gonzaga College High School in northwest DC. Washington, DC – The D.C. Divas announced today that Alison Fischer will return as their head coach for the 2015 season. It will be Fischer’s fourth season as the team’s head coach and her 14th season overall with the Divas as both a coach and a player. Alison Fischer first joined the Divas in the team’s inaugural season in 2001, earning praise as a standout defensive back for ten seasons. She was recognized as a leader on the field by her teammates and was a three-time team captain. After her retirement, Fischer was hired in 2012 as the head coach of the D.C. Divas, becoming one of the few female head coaches in women’s football. Fischer has already experienced remarkable success as the head coach of the Divas from 2012-2014. She ranks second in team history in wins as a head coach, behind only legendary former Divas coach Ezra Cooper. In her first three seasons on the Divas’ sidelines, Coach Fischer has led the Divas to three division titles and three top-five finishes in the final women’s football national rankings. This holiday season, the D.C. Divas are partnering with Holiday For Hope 2014, the largest holiday celebration for homeless and underprivileged children in the DC metro area. The Holiday For Hope celebration provides a day of food and entertainment for some of the neediest members of our community. Several Divas players and staff will be volunteering to help serve at this fun-filled event for over 800 homeless and underprivileged children and their family members. Holiday for Hope is made possible through the work of philanthropic individuals and organizations in the national capital area who are passionate about giving back and being involved in their community. Holiday For Hope has developed relationships with many organizations and shelters in the D.C. metro area that serve homeless and underprivileged youth to ensure that the participants at Holiday For Hope are those who need it most. The Divas would like to invite our fans to join us in volunteering for Holiday For Hope. Volunteers will receive a full day of entertainment, a holiday feast, and a bag of gifts. Most importantly, they will have an opportunity to make the holiday season a little brighter for those in need. Holiday For Hope 2014 will be held on Sunday, December 14, from 8 AM to 5 PM. The event will be held at Delta Produce, 1617 Eckington Place NE, Washington, DC. For more information, please contact Tiffany Nickerson at fnewine@gmail.com. The D.C. Divas are proud to support Holiday For Hope 2014 and their efforts to help needy children this holiday season. Please consider joining us at the Holiday For Hope event on December 14! Washington, DC – You may have heard this story before. The Divas’ season, it seems, always comes down to this. When the D.C. Divas (5-3) travel to Boston Saturday to face their archrivals, the Boston Militia (8-0), it will mark the sixth consecutive season that these two teams have faced each other in the playoffs. It will break the record for most playoff meetings between any pair of teams in women’s football history, currently shared by the Sacramento Sirens and Seattle Majestics (2003, 2004, 2005, 2007, and 2012). What’s incredible about the Divas’ and Militia’s rivalry, however, is that these two teams have clashed in the postseason six years in a row. The D.C. Divas and Boston Militia have met in the playoffs every season since 2009. Other than the Divas and Militia, no two teams in women’s football history have ever met in the playoffs more than three seasons in a row. In their regular season finale, the Divas fell behind against the Boston Militia, 21-0, a deficit that largely contributed to the Divas’ 29-28 defeat. Fischer was particularly pleased with how the Divas were ready to play from the opening whistle against Columbus. Now the Divas must hit the road to face a team that has beaten them twice this season by a combined five points. Both regular season contests against Boston came down to the final minute, and while the Divas have improved enough to challenge the Militia until the final whistle, they know that the final step – actually triumphing over Boston – is the most difficult one. The winner of the Divas-Militia contest advances to the Eastern Conference championship game. The Divas have never made it to the conference title game since joining the WFA in 2011, because they have bumped heads against the Militia before reaching the conference championship each time. Although it’s just a conference semifinal matchup, playoff games between the Militia and Divas have so much intensity and high-quality play that they take on the feel of championship-level contests.